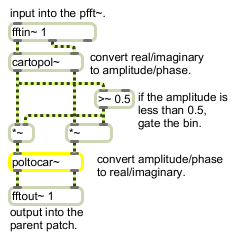 poltocar~ will take any given signal as a polar coordinate and output the cartesian conversion of that signal. signal In left inlet: The magnitude (amplitude) of the frequency bin to be converted into a cartesian (real/imaginary) signal pair. In right inlet: The phase of the frequency bin to be converted into a cartesian (real/imaginary) signal pair. signal: Out left outlet: The real part of a frequency domain signal suitable for input into an ifft~ or fftout~ object. Out right outlet: The imaginary part of a frequency domain signal suitable for input into an ifft~ or fftout~ object.